One of the world’s most accomplished contemporary calligraphers Dr Nassar Mansour joined us this August for two popular Arabic calligraphy courses and a lecture on Islamic Calligraphy presented by The Prince’s School of Traditional Arts in association with the Bagri Foundation. We enjoyed visiting his course on Diwani Script from 15 – 19 August, a very round style, which was developed during the reign of the early Ottoman in the 16th century and reached its peak during the 19th century. Diwani was used particularly in the writing of all royal decrees and chancellery documents, and is still used for invitation and greeting cards. As Kenan Šurković states, Diwani is the most ‘decorative’ Arabic script and ‘is marked by beauty and harmony.’ For more information visit the Islamic Art Magazine’s website. During the course, students learnt how to work with a reed pen. With fine precision they learnt how to transcribe the script by working through copy sheets of Diwani to practice the intricate curves of the writing. With absolute accuracy and working almost mathematically, they created the beautiful script in fine lines which were equally spaced together. By the end of the course they learnt how to create their own name in Diwani as well as a phrase in the script. 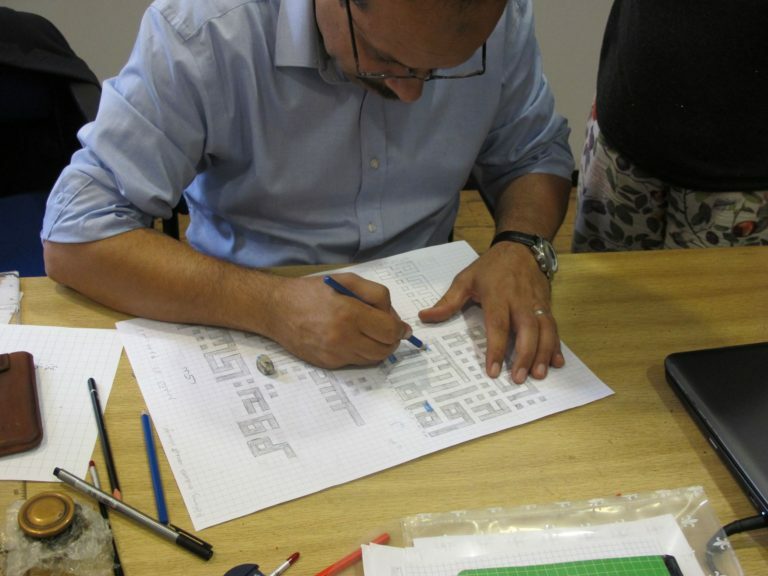 In contrast to the decorative curves of Diwani, Dr Mansour taught the geometric style of Squared Kufic Script from 22 – 26 August. Students learnt about this monumental script which was developed in the 13th century, used on both manuscripts and buildings and popular in Central Asia, Iran and Afghanistan. The character designs were made in square forms with black lines interspersed with white, using the same system found on a chessboard. As the Arabic Calligraphy website states, ‘the very simplified rectangular style of Kufi’ is ‘widely used for tiling’. The students drew their script on graph paper with mathematical equipment. We also enjoyed Dr Mansour’s fascinating lecture on Islamic Calligraphy: Art and Practice on Thursday 25 August, 7:30pm at Asia House. Dr Mansour examined why calligraphy is so important in Islam, bringing together, history, philosophy and artistic techniques. The talk explored the importance of calligraphy in spreading the divine word of Islam and its significance in the history of Islamic art. The lecture began with an audio recitation by Qari Abdul Basit Surah of verses from the Quran which Dr Mansour beautifully transcribed for the audience in Muhaqqaq, an archaic script predominately used for writing and copying the Quran until the 16th century. Dr Mansour explored the significance of writing in Islam as well as the emphasis on good and ‘beautiful writing’. He examined the origins of the transcription of the Quran written by master copiers and presented as a standardised text for Muslims to not only follow for the text itself but also for the style of writing. Dr Mansour addressed the use of calligraphy in art and architecture, referencing the Dome of the Rock in Jerusalem as ‘one of the most important surviving examples of calligraphy on buildings’ as well as how it was written on objects such as vases and coins. Dr Mansour also discussed calligraphy in his own work including his masterpiece Kun, described by Syed Tajammul Hussain as ‘one of the most iconic works of Islamic art in the 21st century’. For more information about the piece visit Bonhams’ website.